The economist most associated with Asset Allocation is 1990’s Nobel Prize winner Harry Markowitz. Markowitz studied economics at the renowned University of Chicago under lots of economics heavyweights. Milton Friedman, as Markowitz recalled in his Nobel Prize acceptance speech, even went so far as to say that Markowitz’s explorations into portfolio allocations weren’t economics. Regardless, Markowitz gave his name to the Markowitz (also known as efficient) Frontier. 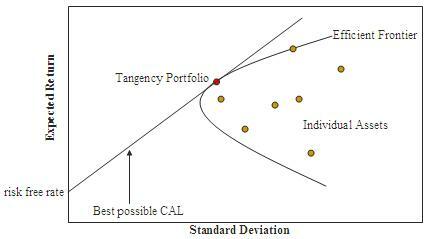 Modern Portfolio Theory states that the Markowitz Frontier is the point when a portfolio cannot lower its risk (through diversification) for a given rate of return. In a quickly falling market, the correlation of most assets actually increases. This is a strange side effect of quick selling which also manages to turn Asset Allocation on its head. All of the carefully diversified asset classes investors in the AA system bought into years ago (and rebalanced often) all fell simultaneously. As you can see, commodities seemed to be uncorrelated with the index. Suddenly, they started to look a lot like stocks and fell just as quick. Note that ‘risk’ in Modern Portfolio Theory is approximated using standard deviation of returns, a backwards looking indicator. There are other ways to look at risk… implied volatility of options, for example. Regardless, there is no way to completely know the risks before a scenario like a ‘Great Recession’ happens. The Nail in The Coffin for Asset Allocation? Does this convincingly prove anything about the demise of Asset Allocation? Of course not. Lots of investing styles lost money in the recession… Warren Buffet’s value investing style (using Berkshire Hathaway as an example) even lost money. There are also some asset classes that did well throughout the downfall of the stock market, like government debt. Perhaps the issue isn’t a failure of Asset Allocation, but an improper selection of the asset classes which investors put their money into (a mistaken belief that certain classes would stay uncorrelated, even)?